1. Twenty-five miles northeast of Fairbanks the Fort Knox Mine is the largest gold producer in Alaska and produces 900 ounces of gold per day. 2. The Pogo Mine near Delta Junction produces 400,000 ounces of gold per year and is an underground mining operation. 3. Nixon Fork in the interior of Alaska is an Alaska gold mine that annually produces 136,300 ounces of gold. This is a small underground mine, but generates revenues of over 4.8 million annually. 4. The Kensington Gold Mine northwest of Juneau is a newer mine that is currently undergoing environmental issues, but is expected to extract 1.35 million of ounces of gold during its lifetime. 5. 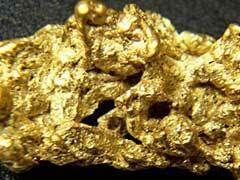 The Big Hurrah is the main underground mine in the Seward Peninsula and gold is found in quartz veins. At this time, however, the mine is under producing and waiting for additional business partners with mining permits. 6. The Donlin Creek area of southwest Alaska is an undeveloped gold area that is currently includes gold mines for sale to the highest bidder and those who can obtain environmental permits. This area is reported to have gold resources of more than 40 million ounces, and may be one of the richest gold deposits in the world. 7. An underground Alaska gold mine in the northeast, the Nixon Fork Mine has reports of 131,500 ounces of gold and placer mining in 1998 is famous for the discovery of one of the largest gold nuggets weighing 294 ounces. 8. Klondike gold rush facts include a discovery of gold along the west coast of Alaska that currently houses the Hardrock mines of Rock Creek and Big Hurrah. Rock Creek Mine produced gold ore until design flaws such down the operation. 9. The Pebble Mine in the Bristol Bay watershed is an underutilized Alaska gold mine that is under scrutiny. There are huge deposits of gold in this area and placer mining and recreational mining are now the only source of gold discovery currently ongoing in this area. 10. Alaska gold is hugely undiscovered with environmental and governmental regulations preventing new mines from being opened. With the environment concerns in Alaska gold mining, gold mining in Oregon is becoming more researched. Current claims for beach gold in Coos County Oregon include simple placer claims as well as potential for hard rock mines. Mining companies from Alaska have filed for permits in Oregon following the similar beach gold deposits as in the bays of Alaska.